MINISTER FOR HEALTH Simon Harris has tonight welcomed the appointment of Dr Peter Boylan to assist the HSE as it prepares to implement arrangements for the termination of pregnancy and related services. 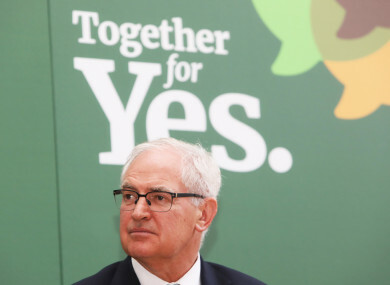 Dr Boylan was a notable advocate of repeal during the recent referendum campaign, appearing on a number of debates. He has just completed a two-year term as chair of the Institute of Obstetricians and Gynaecologists, and was previously the Master of the National Maternity Hospital. Following the referendum which saw the electorate choose to remove the Eighth Amendment from the Constitution, the government has indicated it will introduce legislation to allow for the termination of pregnancy in a number of instances. The expected legislation would allow abortion without restriction up to 12 weeks of pregnancy and in very limited circumstance thereafter, such as when the mother’s life is at risk, as outlined here. That legislation is expected to come before the Oireachtas in the coming weeks. In this new role with the HSE, Dr Boylan will liaise with medical colleges to ensure robust clinical guidelines to support the delivery of the service. He will also continue to play a leadership role with the relevant medical colleges, the Department of Health said. In a statement welcoming the appointment, Minister Harris said: “Peter Boylan has a wealth of experience in caring for women. Over the course of his work, he has proven himself to be a strong patient advocate and a compassionate campaigner for women’s rights. I am grateful to him for taking on this position and I look forward to him working with the HSE to ensure safe, woman-centred services are operational in January. Email “Dr Peter Boylan appointed to assist HSE as it prepares to provide abortion services”. Feedback on “Dr Peter Boylan appointed to assist HSE as it prepares to provide abortion services”.